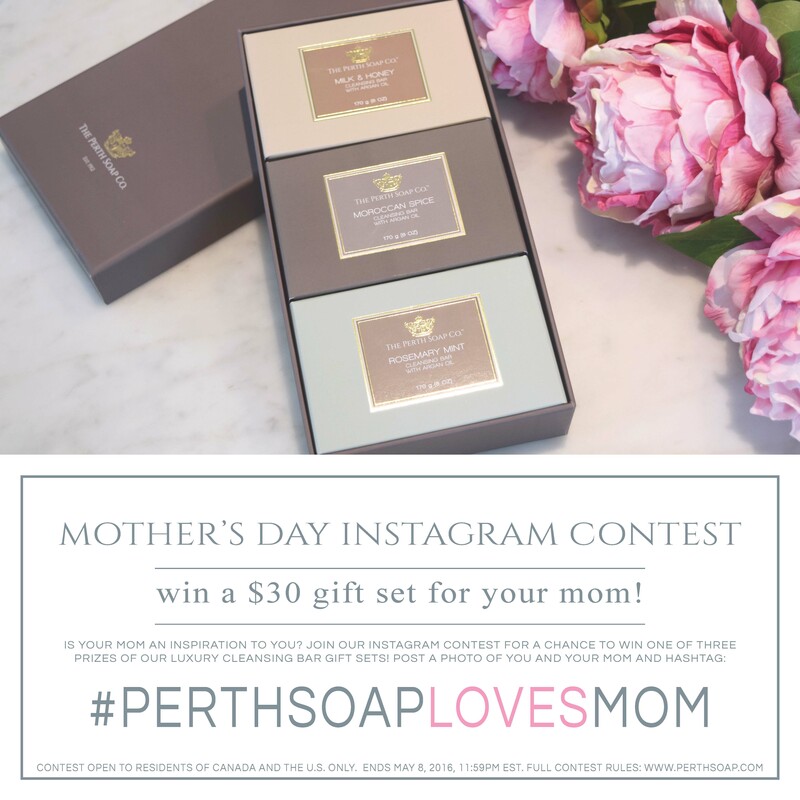 The Perth Soap Co. | Enter Our Mother's Day Instagram Contest! - The Perth Soap Co. Enter Our Mother’s Day Instagram Contest! Mother’s Day is a time to reflect on how much the most important women in our lives have helped us become who we are. It’s a day that we can show them how much they mean to us, and how much they are appreciated. We’re hosting our very first Instagram contest to give you a chance to win one of three prizes of our luxury cleansing bar gift sets to surprise your beautiful Mom with this Mother’s Day! THE PERTH SOAP CO. INSTAGRAM CONTEST (THE “CONTEST”) IS INTENDED TO BE CONDUCTED IN CANADA AND THE U.S. ONLY. (d) be the sole owner of all right, title and interest (including copyright) in and to the Photo (as defined below) submitted in connection with the Contest. CONTEST PERIOD. Subject to the Contest Rules, the Contest begins on April 11, 2016 at 9:00AM, Eastern Time, and ends on May 8, 2016 at 11:59PM, Eastern Time (the “Contest Period”) after which time the Contest will be closed and no further entries shall be accepted. (iv) follow @theperthsoapco on Instagram. No entries will be accepted by any other means. The The Perth Soap Co. will not assume responsibility for lost entries. (b) By submitting a Photo, the entrant grants permission for the Photo and Instagram name to be posted on www.instagram.com/theperthsoapco, www.facebook.com/theperthsoapco and www.perthsoap.com. 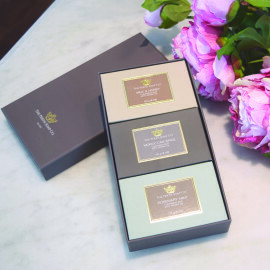 (a) A total of three (3) prizes of our gift box will be awarded; each containing three (3) cleansing bars: Milk & Honey, Moroccan Spice, Rosemary Mint. Retail value of each prize: $30.00 CAD. (b) Prizes must be accepted as awarded and cannot be transferred, assigned, substituted or redeemed for cash. (c) Prizes will be distributed within ten (10) business days after the winners have been successfully contacted and notified of their Prizes and fulfilled the requirements set out herein. (a) Subject to these Contest Rules, three (3) winners shall be selected. On or about May 9, 2016, judges appointed by the The Perth Soap Co. in its sole discretion will choose winning photo submissions, in their sole discretion, based on visual appeal, message and its relevance to and incorporation of the campaign theme. (b) ENTRANTS SELECTED AS WINNERS WILL BE NOTIFIED BY THE THE PERTH SOAP CO. VIA COMMENT ON THEIR PHOTO OR DIRECT MESSAGE WITH INSTRUCTIONS ON HOW TO CONTACT THE THE PERTH SOAP CO. THROUGH E-MAIL BY May 10, 2016. SUCH SELECTED ENTRANTS MUST RESPOND WITHIN THREE (3) DAYS OF NOTIFICATION TO RECEIVE THEIR PRIZE. (a) By participating in the Contest, entrant: (i) grants to the The Perth Soap Co. the right to use his/her name, likeness, mailing address, telephone number, and e-mail address (“Personal Information”) for the purpose of administering the Contest, limited to contacting and announcing the winner. (b) The The Perth Soap Co. will use the entrant’s Personal Information only for identified purposes. SOCIAL MEDIA PLATFORM. This Contest is in no way sponsored, administered, or endorsed by Instagram, LLC and/or any social media platforms on which the Contest may have been promoted and/or publicized. Automated Instagram posts sent via a bot will be disqualified. Automated and/or repetitive electronic submissions (including but not limited to entries made using any script, macro, bot or contest service) will be automatically disqualified and transmissions from these or related Instagram accounts may be blocked. Participants acknowledge the non-responsibility of Instagram, LLC, its officers, directors, employees and agents with regards to all aspects of the Contest. Participants understand that all contest information is provided to the The Perth Soap Co. and not to Instagram, LLC.